Share screen on Skype and use this great feature in your next business meetings or with family and friends. Skype has many great features for collaborating with people and sharing screen with other Skype users is one among many features of Skype. To share screen on Skype follow their simple steps below. 2. If you want to share screen on Skype, video call your contact in Skype. 4. 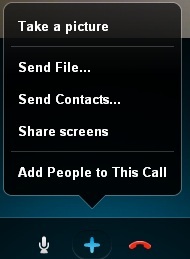 In the Skype Social options, click on Share screens. 5. 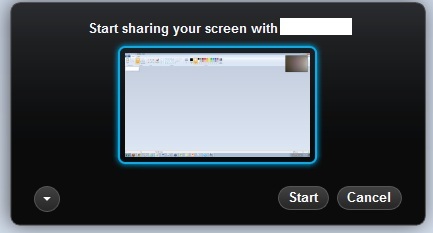 A confirmation window will appear asking you if you are sure you want to share screen on Skype. Click Start and Skype will share your entire screen with your Skype contact. Note that this is not a picture, but a full fledged video stream of what you are doing on your screen. All your mouse actions and movements will be visible to the Skype Contact you are communicating with. Skype is one for the roles mot popular VoIP calling services and has quickly become mainstream thanks to its simplicity and integration into many products including desktop, mobile devices, video game consoles, etc. Skype has become part of online collaboration as many groups use to to work on cross country work projects, school assignment, research, etc. the ability to collaborate with Skype has taken a new dimension as people can now share screen on Skype with other Skype members. This feature is especially helpful if you are giving a live demo or presentation to another person over Skype. The share screen on Skype feature is powerful especially if you have to explain a concept or a model in detail and is hard to by simply sending a PDF or a word document. The ability to share screen on Skype has become ubiquitous in many collaboration tools and video calling services these days and with Skype being a largess coil network of it own, Skype users an reap the benefit of sharing screen with other Skype users conveniently.